X-Small = US 0-2 Bust: 32"-33" Waist: 24"-25" Hips: 34"-35.5"
Small = US 4-6 Bust: 34"-35" Waist: 26"-27" Hips: 36.5"-37.5"
Medium = US 8-10 Bust: 36"-37" Waist: 28"-29" Hips: 38.5"-39.5"
Large = US 12-14 Bust: 38.5"-40" Waist: 30.5"-32" Hips: 41"-42.5"
Please refer to our size chart before you place the order,there may be 1-3cm errors. Due to the different shown display,the color may be different,please understand. Please pay attention to the delivery date. To protect your benefit,please notice the Logo and Store of Fanhao before you place the order,any other seller follows Fanhao is NOT authorized from Fanhao. If you have any problem,please feel free to contact us . 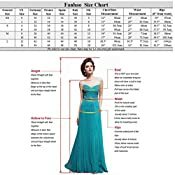 O Neck,half sleeves,embroidery lace,slim sashes,Tea-length,elegant evening gown formal bridemaid dress. 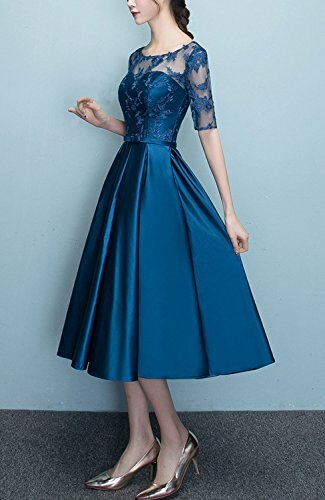 Perfect for semi,club,costume,dinner,party,cocktail,formal evening,ball,prom,homecoming wedding,bridesmaid occasion.